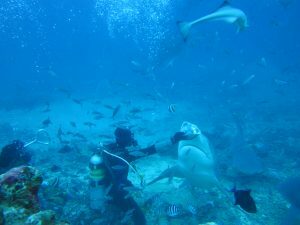 Diving with large sharks is becoming more and more attractive to recreational divers worldwide and often involves attracting sharks with food rewards so that tourists can view the animals up close. Although this type of tourism can have important conservation and socio-economic benefits, some are concerned about the possible impacts on the sharks’ behaviour or health. For example, feeding can change the sharks’ movement and social behaviour, if they spend their time “hanging around” the dive site waiting for food. Also, if the food provided is not as nutritious as their natural prey but becomes the main part of their diets, sharks could become “undernourished”, have slower growth rates, lower reproductive output and/or higher susceptibility to diseases. You can see that it is important to know how much the food handouts really contribute to the sharks’ diet, and if sharks continue to feed on their natural prey or get “lazy” and just sit around waiting for free food! Fiji is home to the Shark Reef Marine Reserve, one of the most famous shark dives in the world. There, tourists can dive with up to 75 large bull sharks, many close to 3.5 m long! Those sharks have been fed for over 20 years, and nowadays they are fed about 1 tonne of tuna heads each week! Researchers have been working at this site for a number of years, so there is already available information on bull shark movements, numbers, etc. Indeed, >150 of the bull sharks have been nicknamed, some based on nice people, some based on external marks. So, we have for example a ‘Stumpy’, a ‘Grin’, a ‘Whitenose’, and a ‘Scar’. In this study, we used stable isotope analysis to see how important the tuna heads provided are to the bull shark diets. Stable isotope analysis is a biochemical technique that can tell us where an animal’s food comes from. Because the tuna heads had very different stable isotope composition to that of the sharks’ natural prey, it was possible to see if and how much tuna heads really contribute to the overall shark diets. So, we analysed the stable isotope composition of tuna heads and of local prey (fish and other sharks), and compared it with the stable isotope composition of 58 bull shark. Sampling was quick and easy, as only a small piece of muscle is needed, which can be removed using a biopsy punch connected to a spear gun. Our results were surprising! Although a previous study by our team showed that tuna heads are more nutritious than we expected (2.4 kg tuna head can fuel a 200kg bull shark’s energy requirements for approximately 3 days), and up to 1 tonne of tuna heads are given to sharks each week, the importance of tuna to the sharks’ diets was insignificant. This is because a large number of bull sharks regularly come to the dive site, so food has to be shared by many. In addition, not all sharks go to every dive and not all feed every time they go. Also, our previous work tracking bull shark movements shows they regularly move out of the study area, and some spend weeks to months away at a time. So, it seems that bull sharks are not conditioned to the feeding site over the long-term, and prefer to continue feeding on their natural fish prey. 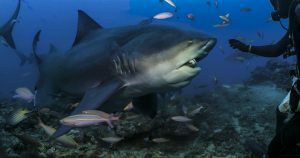 Overall, this study, when combined with other previous studies done at this site, shows that this tourism operation has minimal impacts on bull shark behaviour, and no impact on diets, or health. Also, this shows that stable isotope analysis can be used to identify and monitor the impacts of feeding wildlife tourism in other sites and on other species.